Egypt, once revered as the “gift of the Nile”, has relied so heavily on the river as the primary source of fresh water for cities, industry and agriculture, that the country is approaching an “absolute water crisis” by 2025, according to the United Nations. As a developing country located in the arid region of the Middle East and North Africa (MENA), the per capita share of fresh water is shrinking every year as a result of continuous population increase without a corresponding increase in the country’s share of fresh water. Figure 1 shows the increase in population versus the decrease in per capita share of water resources. Graph developed from Aquastat Database. 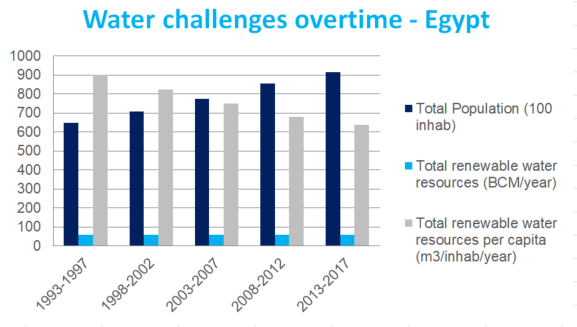 Egyptian regulators and policy makers realised the urgent need to protect the quality of Egypt’s valuable and scarce water resource, and started applying strict regulations and standards. One of these is Law 48, which sets a stringent water quality standard for treated wastewater reuse and discharge into water bodies (e.g. drains and canals), making full compliance difficult and very expensive. Just to put the scale of the challenge in perspective, the applied standards are even stricter than those applied by the EU (as explained in the table below), where water availability and capabilities to ensure high level of wastewater treatment are higher. 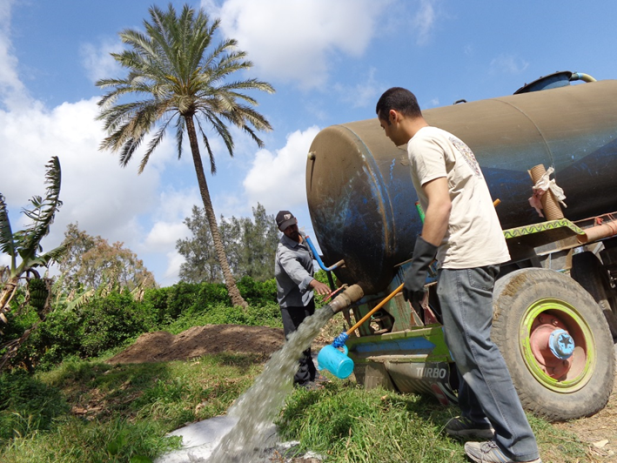 The informal use of untreated wastewater for irrigation purposes in Egypt has serious health impacts on the population.  The World Health Organisation (2014b) has estimated that over 800,000 deaths in low and middle income countries have been caused due to sanitation and wastewater – related diseases either through the informal use of untreated wastewater for food production, contaminated drinking water or inadequate hygiene practices. Such situation affects the country’s efforts to achieve Sustainable Development Goals (SDGs); particularly SDG 3 (Good Health and Well-Being) and SDG 6 (Clean Water and Sanitation). The little success of Law 48 in protecting the Nile and its waterways from degradation shouldn’t prevent Egypt, a fiercely water-stressed country, from tapping into the potential role of treated wastewater reuse as an alternative source of water supply. Approximately 99% of wastewater is water and the 1% is suspended, colloidal and dissolved solids . In addition, wastewater is rich in valuable resources such as phosphorus, nitrogen and potassium, which are vital for agricultural production and the prevention of soil degradation (Mihelcic et al., 2011). Accordingly, wastewater has been considered a renewable resource, as it is the only source of water that is increasing at almost the same rate as population growth.  Considering the diversity of actors and stakeholders, the responsibilities of the main actors in relation to governments and public administration, regulatory authorities, service providers and users have to be clear. These responsibilities should, collectively, ensure that the obligations towards the delivery of the Services are met in an equitable and non-discriminatory way. Egypt has now the opportunity to get this right. The importance of incorporating treated wastewater as a resource is reflected in the proposed Egyptian national vision for wastewater reuse 2030, where the Egyptian government is planning to reduce the number of unserved people with an increase in the number of wastewater treatment plants and reuse the treated wastewater – mainly for irrigation- within the desert front governorates and the Nile Delta governorates. Such vision needs to be within a framework that guarantees collective participation of different stakeholders at different levels of action (city, basin, utility) where all stakeholders have a clear role to play and understand their own responsibilities to replenish water resources. Although it is just a vision so far, it reflects the willingness to improve water sector in the country and that the future is not only full of challenges but there are potential ways forward. Such framework is reflected in the IWA principles for Water – Wise Cities.